Workshop aiming to build a number of 3D printers of the "delta robot" principle. We will try to stick to the original design as much as possible, but with metric/EU parts. Querying wishes of participants in regards to build volume, other details, etc. Scheduling a first pre-purchase planning meeting? I've built my first printer with 1 meter aluminum extrusions, but a bit higher or lower is also possible. Say minimum ~75cm, max ~1m20 maybe ? It would be good to hear everyone's preference to get the order of that under way. 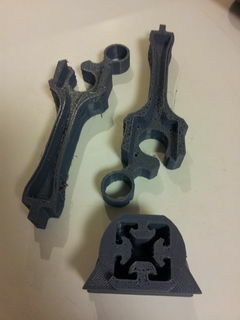 Yesterday I have printed three parts -see pic-. The two upper parts each took 3,5 hours to print. The lower one took 3 hours. The two upper parts are supposed to fit together, but it is extremely tight, I need to test if it fits or that printing adjustments need to be made (or machining...) Also, whether the lower part fits my extrusion profile which is hard to test without disassembling my printer..
Then, as each printer needs six pcs of each pictured part (not 100% identical but close enough) this means 40 hours of printing(!) for just the base building blocks for 1 printer. This means careful planning is in order to avoid disappointments, and perhaps an early start on printing objects. I, Ultratux, will probably build one as well, even though I have the earlier adapted variant. rad0 will build one and volunteered to document the whole process. It should be well understood that changing or adding options like carbon fibre arms, different controllers, more hotends, different dimensions etc will drive the price up. But to the best of my knowledge, this bill of materials is complete for building a working complete printer, without compromising. Please also note I did my best to estimate shipping and other fees correctly, but I cannot guarantee this will be 100% accurate. Maybe allow for a safety margin. In the mean time, a start should have been made with printing many of the base parts as shown in the pic. For 4 printers, we'd need 48 such parts, (plus a number of smaller parts). However, it has transpired that we need to have the aluminum extrusions to ascertain a good fit, before printing all parts. Then to assemble and thread the towers, the only part(s) missing are the stepper motors. So by this time, we can either order the stepper motors, the stepper motors plus controller boards, or even ALL the remaining parts (extruder parts, hotends, heatbed etc.) So there is time until this step to choose hotend options, controller options, etc. 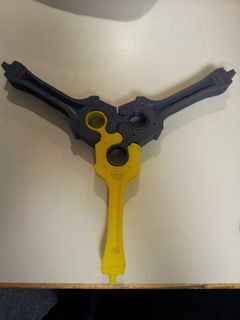 Today I printed a third arm, filed all three down a bit, removing debris and fit them together (a hammer and some careful use of it is required). It is a tiny bit too tight which is apparent by the somewhat wider gaps on the edges, but I think it still fits nice. It is very stiff and sturdy. Good. Can sustain much higher temperatures because it has no PEEK or PTFE parts. Like over 300. Or even over 400. Has no PTFE parts that can deteriorate, swell, leak, pinch or crush the filament, so probably more reliable. Has instead of a power resistor a ceramic element which heats up extremely much faster. Has a channeled fan casing/duct so the cooling isn't accomplished by accident, but with degrees of certainty. Has a mechanical weak point, so a head crash into the bed or something similar is really to be avoided at all cost. Sadly, my time is very limited this week due to personal reasons. Stay tuned for news later! To cut a long story short: the new hotend is Fan-effing-tastic. Not only have all my extruder problems disappeared, but I was able to increase print speeds 220% (from 50 to 110) and as a bonus, I see no more stringing, as if by magic. This is the best return-on-investment I could ever have hoped for. For my first printer I searched many shops to find a suitable round cheap glass bed. This proved rather hard to find. I finally got lucky in a Blokker store which sells a 30cm glass turntable for food serving purposes. Hardened glass, smooth edge, cheap: perfect. I bought two.. One spare. Now, I need to find a bunch more but... they no longer carry them. I visited 4 shops yesterday to no avail. Today, one which -upon inquiry with the manager- turned up two, stocked far away in the 'basement'. So, IF you happen to stumble onto one of these, do not hesitate and buy ! As of today, we need 2-3 more still... Update: I managed to get my hands on 3 more, so this has been addressed. A week ago I found out the STL files of the parts that ought to fit 'around' the aluminum extrusions, didn't fit my current extrusions. I started looking into ways to change the STL files or find a different source for the extrusions. This proved hard, many vendors don't carry it, are unclear whether they carry it, or had extrusion profiles that were incompatible too, for various reasons. In the end however, I found out that my original source carries two variants of the 40x40 profile, and the second, thicker, heavier one does seem to fit our STL files... somewhat unexpectedly. So this ought to be fixed already. I've meticulously checked overlayed printouts of both items, and I feel confident it will fit inside. Otherwise, we could always still do some adjustments on the OpenSCAD files. I wasn't happy with the prints we did; once the extrusions were there, we found that the braces need serious filing in the corners. I opted to adjust the corner radius in openscad, that ought to help. Secondly, the three tripods should fit together much easier, I also saw tolerances there that were unacceptable. I tried to recalibrate the slicer to make those errors diminish or disappear. We'll have to see. Also, I finalized the number of participants, therefore the bill of materials. We started to order the first few things, either because time constraints force me to, or because we simply need them to proceed. I had skipping or slipping in my left tower which destroyed a lot of prints, usually 80% through. This was getting to be a real problem; I managed to avoid this problem by bringing the speed down from 120 mm/s to 90 mm/s. But it merits future attention. At least now, the printer prints reliably again. Having done some reading and research I felt the necessity to go for magnet-ball joints, so I ordered the magnets and balls. The shipping of such items can take many weeks, so I hope delays won't get too bad. We have as yet to find (or design) carriages and an actuator/platform that will fit those, but I feel confident that can be found, adapted or designed. This page was last edited on 14 July 2015, at 23:42.